BackupGenie is yet another cloud backup and storage service owned and operated by JDI Backup Ltd. And though some of their other services, such as JustCloud, have garnered a lot of negative attention, BackupGenie seems to be slightly superior to a few of their other services. That said, there are likely better alternatives that provide better value. The cloud backup & storage industry is becoming incredibly competitive, and BackupGenie just might be falling behind the times. 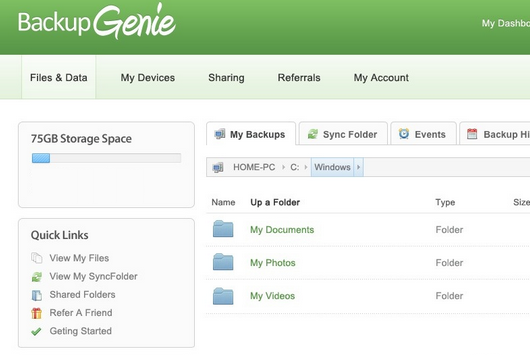 For starters, understand that BackupGenie is a backup service available for both home and business users. They focus on back up and file sharing, and one of their goals was to build a clean and simple interface. The interface is simple and easy to use, though some people might wish for more advanced features and settings. Furthermore, file transfers are secured with 256-bit SSL encryption end-to-end, and various plans offer different features depending on your needs. In addition, they are based in England, so users won’t have to worry about potential interference from the NSA. User reviews and feedback have been pretty bland, and after giving the service a good run through, I would say that it does work as advertised. 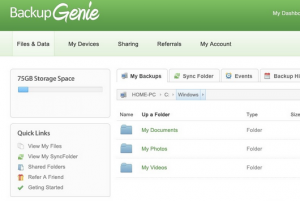 Backup Genie offers three plans for home users at 75 GB, 250 GB and unlimited data. Their basic plan starts at 75GB storage online for $4.50 USD per month ($0.06 cents per gigabyte per month). In addition, they offer 250GB for $7.00 per month, and lastly, they offer unlimited data for $10 per month. The ultimate, unlimited storage plan is charged at an extremely competitive rate for the fact they provide you with unlimited data, although $4.50 for only 75 GB of data isn’t that great. 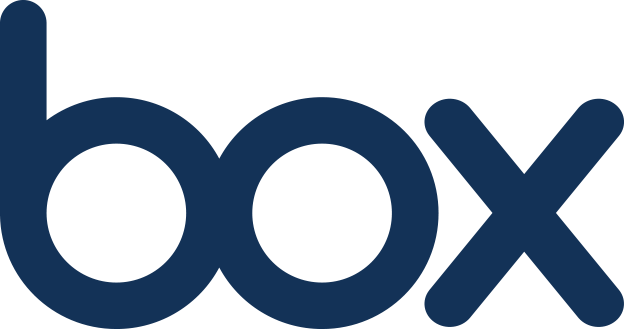 For example, Dropbox will offer and entire terabyte of cloud storage for $9.99 per month ($0.009 cents per gigabyte per month). One of the great things about their service, though, is that with all their plans they offer a 30-day money back guarantee. This is generally more than enough time to take their service for a test drive and to decide if you want to make a purchase. On the other hand, their business services have a completely different model. Business users can pick from Standard Business or Enterprise level, offering 100GB ($35.94 a month) and 500GB ($71.94 a month) respectively. The cost does increase comparatively to home services, but comes with an administrator control panel, network and external drive backup capabilities, and incremental data storage add-ons. However, there are competitors that offer the same features to home users. Depending on the number of computers and extra space you may need, the price varies, but remains extremely competitive for how dependable it needs to be. Business users also benefit from functions such as network drive support, team collaborations, user permission management, unlimited users, and even unlimited disk space – as long as it is used for business purposes. BackupGenie has more reliable security than JustCloud (owned by the same parent company), and provides end-to-end data encryption, though they lack “zero-knowledge” security. Zero-knowledge security is a term that means users manage their own encryption keys, making it 100% impossible for employees to decrypt and potentially read stored user data. BackupGenie lacks this feature, but they do encrypt data as it is in transit to their servers and then encrypt that data again for storage using AES-128 and AES-256-bit encryption. In addition, the business-class services include tools that allow administrators to assign access permissions on a per-user basis. All in all, BackupGenie has adequate security. Unlike JustCloud, BackupGenie doesn’t charge extra for “supercharged” file transfers. In fact, their service provides speeds of 200Mbps, which is more than adequate for most users. Though gigabit Internet connections are growing more popular, 200Mbps is more capacity than the average user has with their ISP. Oddly enough, they too have a speed test on their website that was mysteriously absent and only produced a “page not found” error. In order to test their claims, I tried backing up a simple 50MB folder that contained music and a few small text documents. It should be noted that I use an ADSL line with 5Mbps download speed and 1Mbps theoretical upload limits, and the procedure worked significantly faster than JustCloud. It only took 2 minutes and 14 seconds, which isn’t too shabby. Backups run moderately efficiently through their automated service, too. Users can also manually drag files and let the app handle the rest of the backup procedure, providing some degree of manual control over the process. Once synced, users can access files across multiple platforms and devices to save tremendous amounts of time. The app runs alongside their web portal and features a restore tab for file restorations. This allows users to grab any file they’ve uploaded and restore them easily with one click access. 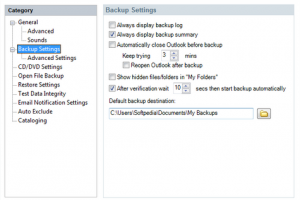 It is just as easy and intuitive to perform a backup as it is to restore all of your files when required. Having access no matter where you are located also makes it easier to travel with your work and personal media files with ease. File versioning is also available for frequently updated documents and files. Live 24/7 support is offered by e-mail in order to contact the team directly. They also have a knowledgebase that contains the usual pages such as FAQs and video tutorials. However, their support page lacks a direct SNR number or support queue number to contact support staff, which is frustrating. The tutorials themselves will cover most basic inquiries and a few of the less common ones, but the team behind BackupGenie is available to help users with more challenging problems. So, what does it all boil down to? Well, first let me say that JDI Backup Ltd., the parent company that owns a smattering of backup services like JustCloud and BackupGenie, has garnered a lot of distrust and negative reviews. This lack of trust would make me hesitant to use their services. That said, BackupGenie is one heck of a lot better than JustCloud, though it likely still isn’t your best cloud storage and backup option.